Badges can be earned by completing various tasks on the website. Please sign up or login to start adding products to your wishlist! New from Clinician's Choice, GLISTEN is a unique provisional polish designed to leave a beautiful glistening shine on provisionals, veneers, crowns, bridges, inlays, and onlays. 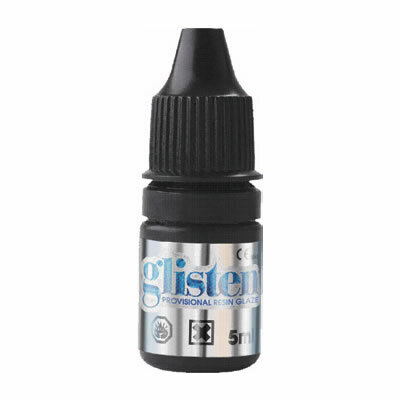 Because of its resinbased formulation, GLISTEN can be applied and cured intraorally or extraorally. Its technique is fast and effictient: simply apply a thin layer of GLISTEN and light-cure for a lifelike shine. Thank you for your submission. We will answer your question as soon as possible. You will be notified once your question has been answered. This email has already been registered. Please uncheck the Create Profile and Submit the Review OR Please verify your email address using the link sent to your email. The CAPTCHA you entered was not correct. Please enter the New CAPTCHA correctly and click submit. This email has already been registered but not verified. Please uncheck the Create Profile and Submit the Review OR click on the Resend Verification Code. Would you like to sign up for a free dentalproductshopper.com user account? I don't like it Somewhat dislike it It's OK I like it I love it!